Yesterday I was up bright and early to catch the Pacific Surfliner Amtrak service down south (those of you know my my guilty pleasure for train journeys will know how excited I was for this). I was heading down to Laguna, through Los Angeles, to meet with Calla Allison, who set up the MPA collaborative network off the back of her experiences as a stakeholder in the Marine Life Protection Act MPA redesign process in the Orange County region. Four hours later, the train stopped off at the pretty mission town of San Juan Capistrano, where Calla met me and we drove off to the coast. 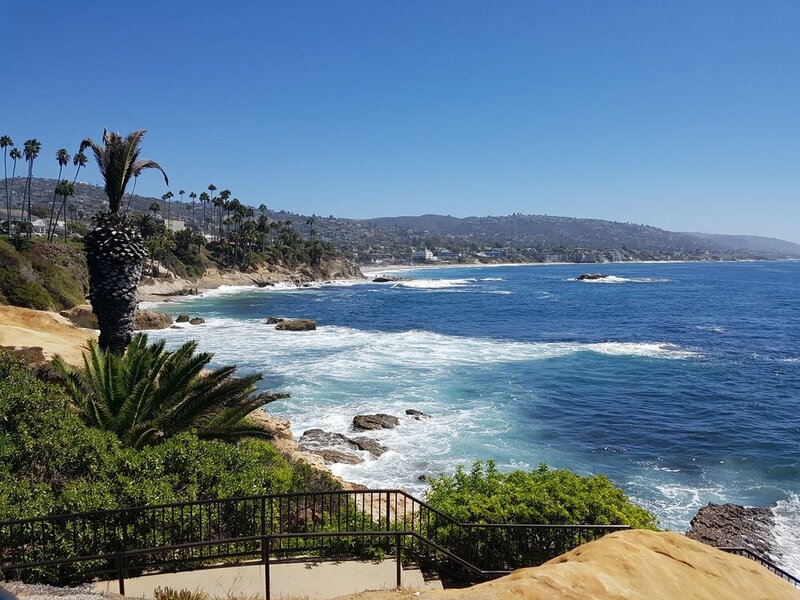 Laguna is a beautiful stretch of rocky coastline, interspersed by sandy coves and beaches, with a very separate character to the miles of sandy beaches heading south. And the million-dollar homes are perched precariously over the cliffs in search of that priceless sea view. It’s certainly a town of wealth and, made famous over the years in various TV shows, attracts a lot of visitors and a lot of coastal pressure. In the midst of all this, most of the intertidal rocky areas, and much of the coastline in general, is covered by marine reserves, with one tiny old SMR from the late sixties expanded to a network of sites. How do such highly protected sites work in such a crowded space? During the MPA resign process, Calla was representing a diverse set of organisations on behalf of the City of Laguna, negotiating some tough battles with fishermen and other stakeholders to come up with an expanded set of SMRs. These battles (as I’ve found out along my journey, turning my assumption that all stakeholders supported the SMRs on its head) were bruising and left lasting resentment in many cases. But when the MPAs were identified, there was no equivalent network to keep stakeholders talking to each other in Orange County to ensure the sites were well-managed as a shared responsibililty. So Calla changed roles and founded the Orange County MPA Council (OCMPAC) to do this job, keeping people talking, advocating for more agency departments to have enforcement responsiblilties and developing interpretation and outreach. Research, outreach and enforcement. The success of this group persuaded Calla of the need to expand this bottom up approach to the rest of the south coast, and ultimately (with some nagging of Fish and Wildlife Service) a grant of $20,000 to get these “collaborative networks” off the ground up and down the coast. The key principles being that local people talking to each other works, enforcement is best shared among people who know the areas, and that the variation in stakeholders, circumstances and MPAs from North to South should be embraced. Calla’s enthusiasm and love of the outdoors was inspiring, and with limited resources she really has to be congratulated on creating and moulding the collaboratives into largely self-governing and independent entities. In Laguna, I particularly was impressed by the progress made in expanding the responsibility for the MPAs beyong simply the usual suspects, so that lifeguards and even the animal welfare departments of Laguna City know of the reserves and have the power to issue spot fines for violations. I was also reminded of the importance of bringing social science into the MPA process: we are after all managing people’s behaviour in these reserves, rather than the reserves themselves. The ‘simple’ ability to empathise, understand, respond, propose, compromise, defuse, laugh with or recognise the views of others with an interest is ultimately a large key to success. And with stakeholder engagement, local issues matter: children attend the same school, feuds rise and fall, other things might be in place beyond simply the MPA itself. No amount of national engagement will be able to tease out these local issues. It was whistlestop tour of Orange County but a really enjoyable one, and after a glass of wine at San Juan Capistrano, it was time to take the Surfliner back north. Today’s my last day in Santa Barbara and then back home - what a two weeks it’s been!